Two of our greatest sporting legends took the field on Wednesday, to usher in what promises to be an exhilarating experience for millions of fans as the countdown begins for World Cup action to commence in the Spiritual Home of Hockey - India. While one gentleman from Sundargarh was an embodiment of calmness and resilience at the backline, the other from Khadki was flamboyance personified as he darted, dodged, and shimmied his way past opposition defences, and charmed audiences worldwide with his lightning speed and trademark hairdo. Together, in their prime, they engineered several memorable wins for their side including the 1998 Asian Games title triumph at Bangkok, and so it was indeed a moment to cherish as Dileep Tirkey and Dhanraj Pillay led their respective sides - Dil XI and Dhan XI out on to the brand new pitch at the Kalinga Stadium to play out an exhibition match to mark the inauguration of the upgraded stadium. It was in 2013 that the FIH Executive Board announced that it was most impressed with India's bid to host the fourteenth edition of the World Cup after a total of five nations who had evinced an interest in the same had been shortlisted for the men's event. While Australia withdrew their application before the voting process, Malaysia, New Zealand, and Belgium remained in the fray but failed to outdo the Indians who had hosted the twelfth edition at New Delhi in 2010. In March last year, the FIH (International Hockey Federation) made it official that the capital of Odisha - the ancient land of temples which was transformed by the German architect Otto Königsberger into a vibrant metropolis in the 1940s - would be bestowed the honour of welcoming the hockey world for the prestigious tournament. Hockey aficionados in the country have rarely had it this good, as three major events were held in India recently - the 2010 World Cup was played in the national capital while Bhubaneswar hosted the 2014 Champions Trophy, the 2017 Hockey World League Final, and is now all set to make the upcoming World Cup a memorable extravaganza. True, the World Cup has returned to Indian shores for the second time in eight years but there are noteworthy dissimilarities between the Delhi event and the one around the corner in Bhubaneswar. Well, for a start, the bid for the 2018 World Cup was submitted by Hockey India whereas it was the erstwhile and now defunct Indian Hockey Federation which was responsible for earning the right to host the event in 2010. While the New Delhi World Cup did eventually end up being a success, the initial hurdles with regard to infrastructure and preparedness were glaringly out in the open, unlike the Bhubaneswar event which has, commendably progressed quite seamlessly. For the first time in the history of the competition, sixteen teams, and not twelve will battle it out for top honours and around 1100 players and officials are expected to be lodged in the city during the tournament. 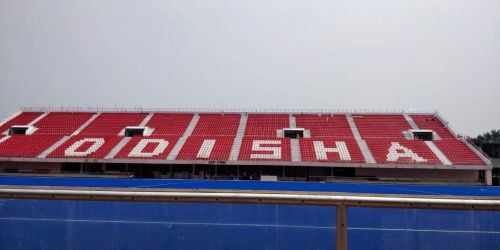 The seating capacity of the Kalinga Stadium has been doubled to 15,000 with a couple of new galleries being constructed, and a brand new Olympic-standard pitch has been laid for the tournament where the Indian team is currently undergoing a preparatory camp. Why is it important for the Indians to camp at Bhubaneswar? At the Champions Trophy at Breda, the new pitch failed to live up to expectations and had to be watered before PCs were taken as the ball failed to travel at a pace which the players are comfortable with. India's Analytical Coach Chris Ciriello recounted as much after the tournament as he analyzed why the overall PC conversion rate for all the teams was dismal - so much so, that Ciriello had to take the matter up with the organizers and suggested the watering can remedy. At London too, the Golden Girls (and other sides in the competition) did not find the new pitch easy to negotiate at the Women's World Cup much to the chagrin of chief coach Sjoerd Marijne. The importance of practising on the actual surface where the matches will be played cannot be overemphasized and that is an area where the Indians can truly capitalize on. Speaking of the home advantage, the Odisha crowd braved Cyclone Ockhi to cheer the Indians on at the Hockey World League FInal last December and their vociferous support aided Marijne's boys to capture the bronze medal. The crescendo is expected to reach fever pitch when the Indians take the field against South Africa in their opener on November 28 and several Indian players have stated, in no uncertain terms, that the atmosphere at Bhubaneswar will help to inspire and spur them on as it did in the HWL last year. Glass enclosures for the media and officials, free Wi-Fi, and improved transportation to and from the stadium will help to ensure that players and spectators alike will be treated to a world-class experience. Neither the dark clouds nor the rain hampered the spirits of the cheering spectators as they witnessed their past and present heroes in action - the only major dampener was watching SV Sunil, on the sidelines when the audience would have liked nothing more than to see the speedy stalwart from Sowmarpet engage in his spectacular runs. Whether or not the veteran striker recovers from his knee injury in time for the World Cup remains to be seen, but If Harendra Singh's side manages to put behind their Asian Games debacle and regain the form and hunger which they displayed at the Champions Trophy, Indian hockey fans will truly have the experience of a lifetime.